Dave King will mount a legal challenge to block any attempted transfer of Craig Whyte's 85% shareholding in Rangers to Charles Green. The club director has been a vocal critic in recent days of what he believes to be the lack of transparency surrounding Green's bid for the club. King has previously stated that Whyte had verbally agreed to give him first refusal on his shares. He has since told Rangers' administrators that he can prove this. "You have been aware for some time that I have the first right of refusal on Craig Whyte's shares and that I will legally contest any transfer to Mr Green, if such a transfer is attempted," King has told the club's administrators Duff & Phelps. "[Fellow director] Mr [Andrew] Ellis has confirmed to me by email that Mr Whyte advised him, during negotiations with Mr Ellis, of his agreement with me. The agreement is therefore not contentious and I have no doubt will be upheld before a Scottish Court." Green, who is leading a consortium in place to buy Rangers, has been frustrated by King's criticism and told BBC Scotland: "We are buying this club on Thursday whether Mr King likes it or not." 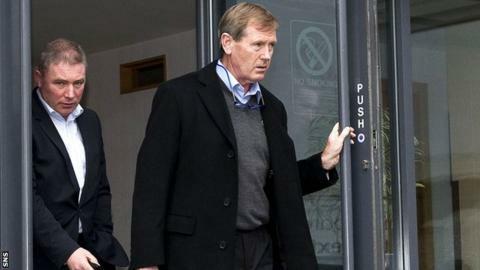 Duff & Phelps informed King on Friday that his directorship of the club was being terminated. "There are regulatory requirements laid down by the Scottish Football Association which require confirmations to be given by the club in respect of all directors of the Company," said Duff & Phelps in an email seen by BBC Scotland. "As the company is currently in administration, it is not possible for such confirmations to be given to the SFA. "This is not a reflection on any individual's status merely a reality of the company's position. Accordingly, where such confirmations cannot be given by a club it is pertinent to remove directors of the company. "Given the above-noted expected change in the board of directors of the company, the removal of the present directors has now been effected at this time." But King responded: "Does this power extend to a director who has an agreement, such as myself, that I am entitled to a board position as long as I remain a shareholder? "Craig Whyte and Gary Withey previously tried to remove me and were ultimately thwarted by that legal undertaking given at the time, and as a condition of, my initial investment." In May, Whyte told BBC Scotland that King's claim to have first option on his shares was "categorically untrue". Amid King's criticism of Green, he also backed the Blue Knights consortium, who lost out in the bidding process. The leader of the Blue Knights, Paul Murray, told BBC Scotland: "Why are we Rangers supporters allowing a guy with no Rangers affinity and who will not disclose any proper details of his bid to buy the club? "The fact that he has been brought to the table by Duff & Phelps, who have a lot to answer for and have chosen not to so far, should make every Rangers fan very concerned. "The whole process needs a full investigation. It stinks and everyone knows it."